All roads lead to New Delhi for tens of thousands of farmers who have started arriving for the big march on Friday morning in a concerted bid to make the Narendra Modi government convene a special session of Parliament to pass two Liberation from Death bills dealing with the waiver of crippling loans, and a hike in remunerative prices to alleviate deep agrarian distress. 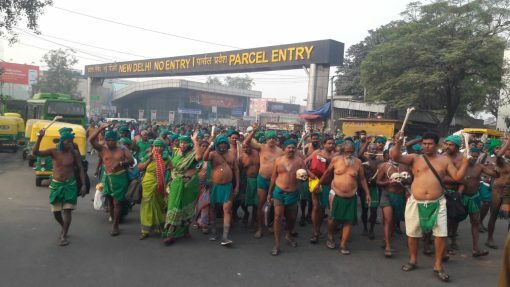 The farmers — landowners, sharecroppers/tenants, women, dalits, adivasis, landless agricultural labourers bent over under the weight of debts — will march for liberation from death to Parliament street from Ramlila grounds in an unprecedented first to secure statutory rights in the form of two Kisan Mukti (farmers liberation) Bills. These have already been introduced in both Houses as private members bills. 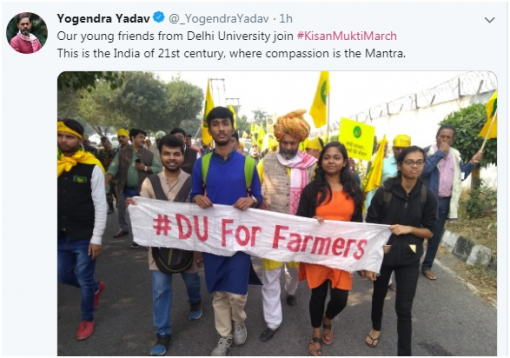 Delhi is turning out in large numbers to embrace the farmers with students, activists, artists, politicians all extending help and solidarity. All plugs have been pulled out for unity and the success of the movement with volunteers spread across the city, with welcome desks running already at strategic points, to ensure the farmers have all the help they require, and the two day stay in Delhi passes without glitch. The discipline is admirable. Specific points have been set up for initial assembly after which the farmers will go to Ramlila grounds and stay the night. 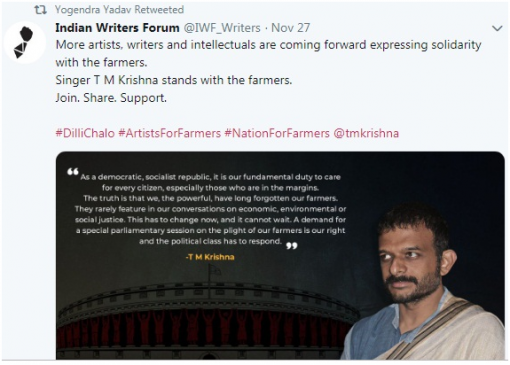 A cultural programme staged by a host of artists and performers will be held at night, and tomorrow morning Delhi will march along with the kisans to Parliament street. Several gurudwaras, volunteers from different NGOs are working together to provide water, mobile toilets, light snacks and medical kits at each welcoming point. The gurudwaras have opened their langars for the kisans with NFF tables at the departure points for Bijwasan and Anand Vihar where there are no gurudwaras. All welcome points have petitions for people to sign urging the government to convene a special 21 days session of Parliament on the agrarian crisis. On Parliament Street — the government did not give permission for the farmers to march to Boat Club — farmer leaders, activists will address the gathering in the morning. The afternoon will bring together political leaders to endorse the farmers demands, and pledge a united campaign for the alleviation of agrarian distress. In the case of Tamil Nadu farmers, more than 350 farmers both men and women arrived at the New Delhi Railway station under the lead of a lawyer turned activist P.Ayyakaanu who is the president of South Indian Rivers Inter-Linking Farmers Association. He was known for his innovative protests of debt ridden and distressed farmers of Tamil Nadu in the capital earlier. He told The Citizen that “despite of 141 days protests, no measures were taken to redress our grievances. We are again back with our skulls and bones to take part in the rally’. Our PM Modi should save us from plight”. After reaching New Delhi Railway Station in the morning, they gheraoed a departing train. On the intervention of Police, they were disbursed and started marching towards Ram Lila Maidan in half-naked posture with skulls, bones so as to join the rally tomorrow. The mega rally of the distressed and debt –ridden farmers begins from Ramlila Maidan and would end at Parliament Street tomorrow, where the leaders of farmers, activists and political leaders would deliberate on the agrarian crisis. Atul Anjan, national secretary of All India Kisan Sabha (AIKS), told The Citizen, “We have invited the opposition leaders like Rahul Gandhi and the chief Ministers of Andhra Pradesh and West Bengal for two-day meet”. Solidarity is pouring in from the different walks of life for March tomorrow. Student bodies, writers, singers, poets, artists, lawyers and many civil society groups are expressing their solidarity and also participating in large numbers. As there is a united voice from various quarters coupled with the general election around the corner, there is an optimism in the air that the power establishments at the centre and states will respond to the farmers' grievances. 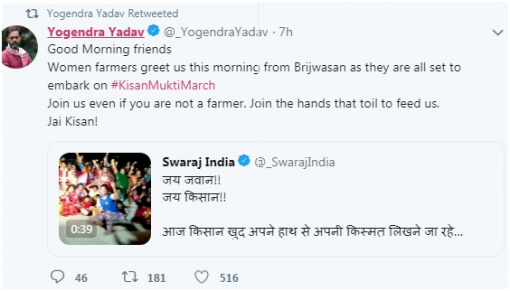 Farmers have in many parts of the country undertaken a series of mass marches in recent years as the interests of Indian agriculture are overlooked and even harmed by the centre as well as the states in the realm of public policy. In the light of the deepening agrarian crisis in the country, the All India Kisan Sangharsh Coordination Committee has been at the forefront in mobilising the distressed farmers and labourers of the country. 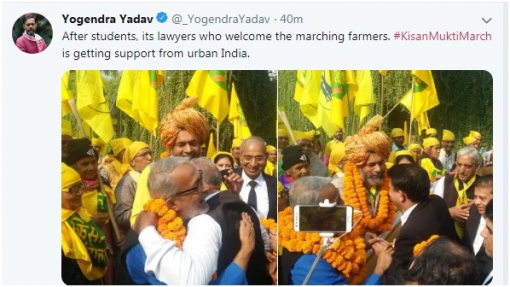 It organised many Kisan rallies in the different parts of the country, followed by the All India Kisan Rally in August last year in the capital, which culminated in the Kisan Mukti Sansad on Parliament Street last November.